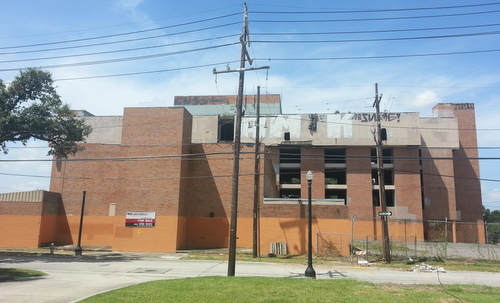 The redevelopment wave across the Lower Garden District is continuing quickly, as residents heard plans Monday night for a new hotel on St. Charles Avenue, a new restaurant space on Constance Street and two new condo projects on Magazine Street and Jackson Avenue. 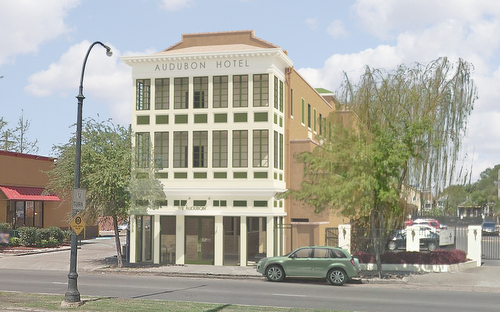 Chris Jones, his wife Jessica Walker, and David Gindin described their vision for the redevelopment of the Audubon Hotel to the Coliseum Square Association as a 30-room boutique hotel designed to attract a younger, more international clientele. Their renovation will actually reduce the number of rooms in the building somewhat, because the older floor plans had shared bathrooms, and they intend to put a bathroom in every room. The hotel does not have room for a restaurant, but its front desk will double as a small bar, Gindin explained. It will also be staffed 24 hours a day, he said. The association board voted unanimously in favor of supporting the hotel project. Beverly House, who works as a “geologist by day,” recently bought the building at 1245 Constance Street (at the corner of Thalia), and plans to renovate the ground floor for a space for a neighborhood restaurant. The building was formerly the Shamrock Tavern and a neighborhood grocery, she noted. The upstairs has three apartments, which she said she renovated and quickly rented. “As you well know, everybody wants to live down here,” House told the association. She does not currently have a tenant for the space, though a number of restaurant operators have already approached her about leasing it. So far, they didn’t fit her idea for the property, she said — some were chains, for example. The zoning already allows commercial use, but House is requesting a conditional-use for alcohol sales, which will be heard today (Tuesday, Sept. 22) before the City Planning Commission. The permission won’t allow her to open a bar, she noted, because of regulations requiring at least half of her sales at the business to come from food. She is also in discussions with the city about the renovations. While city regulations normally prohibit signage promoting alcohol brands, the exterior walls have some vintage panels with ads for Dixie beer. If the city approves, she said, she’s working on restoring those ads as well. The association did not take a vote on House’s proposal. On Magazine at Race Street, architect Chuck Rutledge is also resurrecting his plans for a six condos in a three-story building planned for the empty lot across from Mojo coffeehouse, he told the association. The plan has gotten previous city approval for reduced setbacks from the streets and neighboring lots, but that expired while construction was on hold, and he now needs to renew it, he explained. Finally, the association also heard an update on the proposed redevelopment of the Sara Mayo hospital into a large condo project, which is also headed to the City Planning Commission today. The 211-unit redevelopment is still slated for market-rate apartments, but developers have heard some requests to include affordable housing as well, architect Harry Baker Smith told the association. 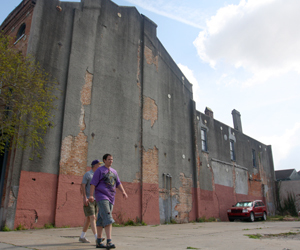 The association split its vote on Rutledge’s project, and did not vote on the Sara Mayo redevelopment. 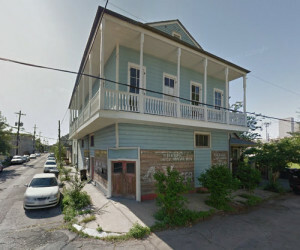 Let’s not let the LGD turn into the French Quarter, full of hotels and tchotchke shops.